The first NJCFE/America Saves/Clarifi “Job Help Fair” event graciously hosted by Caesars Palace in Atlantic City on April 21 was an overwhelming success. This blending of for-profit recruiters and non-profit community support organizations brings a well rounded approach to assisting the under and unemployed. 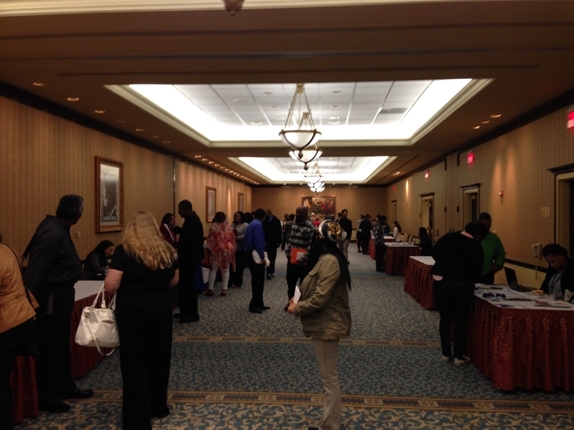 The exhibitor tables were sold out and well over 100 participants from Atlantic City and the surrounding communities met with for-profit job recruiters in retail, healthcare, gaming, banking and non-profit community assistance organizations. Participants pledged to become American Savers and learned about the numerous saving tools available in any economy. The effort was lead by long time NJCFE member Stephanie Bittner of Clarifi and NJCFE Executive Staff/NJ America Saves Coordinator Steven Drulis. Funding for the event was provided by the generosity of our sponsors the NJ Credit Union Foundation and Affinity Federal Credit Union. The success of this event will continue to inspire subsequent similar “Job Help Fairs” throughout New Jersey in communities of need. Additionally, NJCFE will continue to work within South Jersey to advance financial literacy and meet our cradle to grave charge.